Zentangle Christmas Decoration: Zen-out while creating holiday memories!!! It happens overnight. Out with the pumpkin orange and harvest gold and in with all shades of red and green. It’s a bit of work but oh so much fun! Even having to pull the #@%&# cat out of the Christmas tree several times daily adds to the festivity. I would leave the cat alone but the dogs won’t quit barking while Bubba remains perched in there. As a kid our Christmas decorations in our home were centered on an elaborately decorated sixteen foot mantle. Twelve red flocked (yes, flocked) reindeer pranced across the mantle leading an elaborate sled across mounds of white and silver tinsel snow lit with little white lights. Blinking above this scene were dimensional stars that my mother had made out of cardstock, spray painted silver and sprinkled with silver glitter. To a kid it was spectacular! I always seem to incorporate my artwork into my Christmas decorations. This year the stars my mother made 50 years ago came to mind. A Zentangle project with a Christmas theme seemed just the perfect calming project as I shooed the dogs out the door and disengaged Bubba from the tree again. 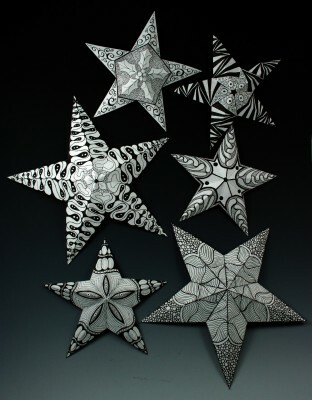 The stars are simple to make and with a little scoring at the right spots turn into darling three-dimensional ornaments. What a wonderful canvas to lay down a little seasonal Zentangle art! I made my original template from folding paper and making one cut (the Betsy Ross method for those of you who paid attention in grade school). But if any of you want to make stars of your own, I have made a star template with instructions for you. You can reduce or enlarge the template to make the size star that works for you. I made my stars with cold press water color-paper and plan to add a little color to some of them. The water-color paper works beautifully for this project. It is heavy and holds the scored creases, has a bit of a tooth to it so it is wonderful to draw on with a Pigma pen. After 50 years my mother’s stars are still in pristine condition, minus a little glitter. It’s remarkable of the longevity of this simple little paper craft and the memories it evokes. So don’t forget to sign and date your stars, as Maria says, respect your work. And think of the fun it will be when your kids unpack that box 50 years from now. Thanksgiving has started. My sister, her two boys ages 10 and 12 and their dog have arrived. Her husband is the smart one of the group, he decided to go climb a mountain for Thanksgiving. Both my university daughters are home, with puppy, fish and hamster. So right now I have 3 dogs, a spring-loaded puppy, a terrified cat, hamster and fish in addition to extra kids and humans. I have assigned the kids the job of keeping the animals from trying to eat each other. I think my husband wishes Kansas City had mountains. An evening to relax, tangle and enjoy great people. Just want to tell you about the upcoming Beginning Zentangle® Class on November 30 from 6 to 8pm. After surviving Thanksgiving this will be a pleasant evening to relax, tangle, enjoy great people and celebrate the beginning of the holiday season before life gets too hectic. I will provide some nibbles for us. Please feel free to bring your own beverage — wine is certainly appropriate. We want to kick back, relax and learn some new calming techniques to help us through the holidays, eh? The class is $35 and includes a class kit to get you started. Since the holiday season has arrived I have designed a project that you can take home with you and use to decorate for the holdays. I will be posting a picture of the project here on my blog in the next couple of days, I just need a little more time to finish a couple of them. I want to take good picture of them so you will see what an awesome idea I had! I think you will be pleased with the project and the decorating possibilities. I will also have Zentangle products at the class that will be available for purchase if you are interested. The class will be held at Breen Development, 5800 NW Prairie View Road. This is just off of I-29 and 64th street in the Northland. When you register I will send directions if you need them. To register, just email me at susanbreensilvy@yahoo.com. I will send you a return email confirmation. Feel free to tell your friends about the class. The more the merrier. Please register so I can order the kits. If I don’t know you are coming I won’t have a kit for you. That would be horrible! Let’s kick the holidays off in style! I hope to see you there. Just a quick note to let you know that I added a November 30 beginning Zentangle class to the Classes page. You will find the classes tab at the top of this page. Where I will be teaching this spring. I met Gennie when I took a beginning silversmithing class from her. I just remember her looking at my work and saying that she had never had a student “do it quite like that before”. She said that to me a lot. The first time she said it was when I got the saw blade in the frame sideways. Gennie should have recognized my talent right then and there because getting a sawblade into the frame sideways is an almost impossible feat and I managed it on my first try. And for all you silversmiths out there, I really mean sideways, not backwards. For some reason Gennie liked me (I like to think she found me amusing) and I absolutely adored her. We have been friends ever since. Gennie is a fabulous teacher, she managed to teach me so what more can I say? I am honored that she has asked me to be an instructor at her studio. Once I get dates nailed down I will be posting my class schedule here on my blog. I am also working on a place to start teaching Zentangle® on a regular basis and hope by the first of the year to have that information for you. Met a wonderful person today, Lacey. She managed to take all the components that I have had floating around out there and made sense of them. Ahhh, feels so good! Thanks Lacey!